Placing the mask over the nose and chin, the holes are then in line with mouth. Oxygen is released by pressing the trigger, allowing you to take a deep inhalation through the mouth and into the lungs. I find I am more energised when using the pure oxygen, and this assists me in performing a good workout. 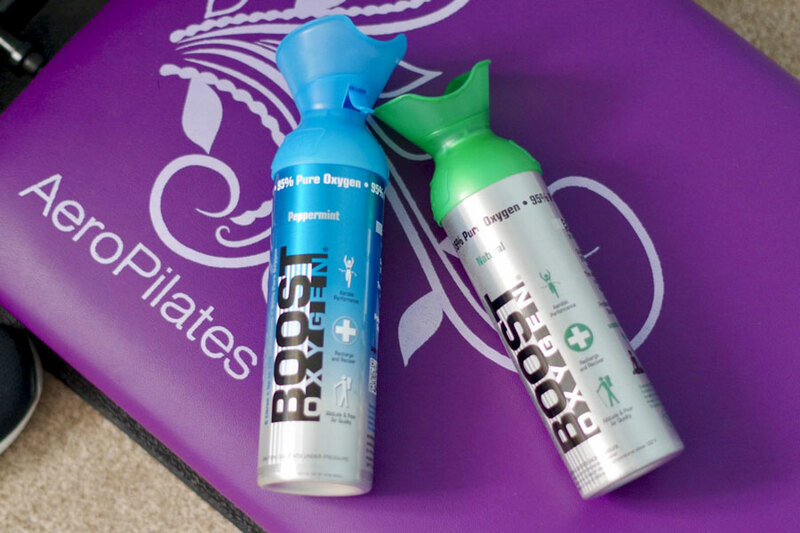 Wether I exercise with my Pilates Reformer, Bodyblade, or performing fat burning aerobics, the oxygen helps prevent me from feeling too fatigued later on. Having Fibromyalgia, anything that helps muscle recovery and lessens fatigue, is a bonus for me! Another benefit I have discovered, (although this is not a medical claim), is that inhaling a few blasts of the oxygen during a migraine, seems to help reduce that muzzy feeling I get with them. Helping to improve blood flow, it helps clear the head a little, whilst relaxing the body and reducing stress. There are medical studies out there to suggest, that inhaling pure oxygen can also help cluster headaches. This brand of oxygen canisters provide several different aromas, of which I am using Normal and Peppermint. All are obtained using natural essential oils, combing oxygen boost healing and performance with aromatherapy benefits. There is also a Beauty Boost Oxygen (for skin benefits), with essential oil aromas of pink grapefruit and frankincense. A handy travel sized Boost Oxygen canister of 40z, provides up to 50 inhalations, retailing at £10.50 each. These large 22oz canisters I am using, provide up to 150 inhalations each, and retail at £17.99. If you are a devoted gym bunny, love pilates or running, whatever form of exercise is your bag and you want to help to improve energy and muscle health, then this is definitely worth trying. "...Insufficient oxygen means insufficient biological energy that can result in anything from mild fatigue to life threatening disease.The link between insufficient oxygen and disease has now been firmly established. The more oxygen we have in our system, the more energy we produce." "I tried Boost Oxygen for the first time at the opening round at Brands Hatch while competing in the Porsche Club Championship. What a difference it made! I had my best ever qualifying and race result as well as my fastest lap time. I will certainly be using Boost Oxygen in the future."